Six people, given assumed names by their mysterious party host, Mr. Body, are invited to a dinner party at Hill House, under the hospitality of Wadsworth, the Butler. Mr. Body is revealed by Wadsworth to be the one who has been blackmailing them all, after learning of their dark secrets, through his accomplices. When Mr. Body is shot in the dark, Wadsworth and the 6 guests soon find themselves embroiled in an escalating multiple murder mystery where they must find the murderer, or risk being the next victim before the police arrive. 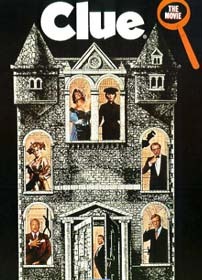 The cast includes: Eileen Brennan, Tim Curry, Madeline Kahn, Christopher Lloyd, Michael McKean, Martin Mull, Lesley Ann Warren; with Colleen Camp, Lee Ving, Kelly Nakahara, and Howard Hessman.